Taali, while not quite like the regular odes to the protagonist in the usual period films, has been packaged well by Sajid-Wajid, the grandeur in orchestration et al. The string sequences especially sound good, the hook played on the oudh-like instrument after 3:52 faintly reminded me of the motif from Chale Chalo (Lagaan) probably coz of the similarity in raaga. The vocals have been impeccably delivered by Sukhwinder and Sonu, no surprises there! Neuman Pinto and Wajid provide the backing vocals. Sukhwinder also does a solo version of the song, but that wasn’t really required methinks. Surili Akhiyon Wale is similar in tune and structure to the romantic melodies that Pritam has been producing of late, and the vocalist is, as usual, Rahat Fateh Ali Khan, backed by Suzanne D’Mello. With all due respect to Rahat’s singing, doesn’t he ever get bored singing the same tune again and again? If there are two people who should be kept as far away as possible from such melodies in future, they are Mohit Chauhan and Rahat. Having said that, Surili.. is nevertheless a good listen. Sunidhi joins the singers in the duet version, and to good effect. Its relieving to hear Sunidhi deliver such soft melodies at least once a while. Salaam Aaya is a tune that grows on you over repeated listens. Had I written this review last week I might have dismissed this tune as boring, but now after hearing it on TV so many times I find it an attractive track. Roop Kumar Rathore has had a good run this year and he does a commendable job here too, complemented equally well by Shreya Ghoshal. Heavily laced with Celtic musical elements, the bouncy Meherbaniyan sounds like a drinking song, Sonu doing a fab job of the rendition. Sajid-Wajid return to their home turf composing this track which is definitely better than the tunes from the foot-tapper genre that the duo generally produce. Rekha Bharadwaj delivers the folksy Kanha in her quintessential manner backed by Shabab Sabri, Toshi Sabri and Sharib Sabri. Wonder if the Sabri brothers had any hand in the composing as well. Whatever the case be, this song too has been nicely done. The composers round things off with another fiddle-dominated Celtic instrumental tune. With a title like Spirit of Veer one might have expected something more heroic in sound, but the tune is entertaining nevertheless. 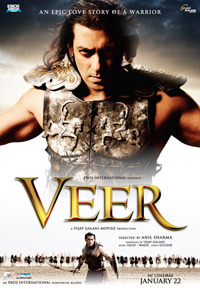 I started listening to Veer with a sense of foreboding, unable to fit together the images of composition by Sajid-Wajid and a period film. But I must say Sajid-Wajid have far exceeded expectations with a remarkable score. Though not all the songs exactly fit the bill of a period soundtrack, this work will definitely count as one of Sajid-Wajid’s career best. If only they came out with such good tracks more often!